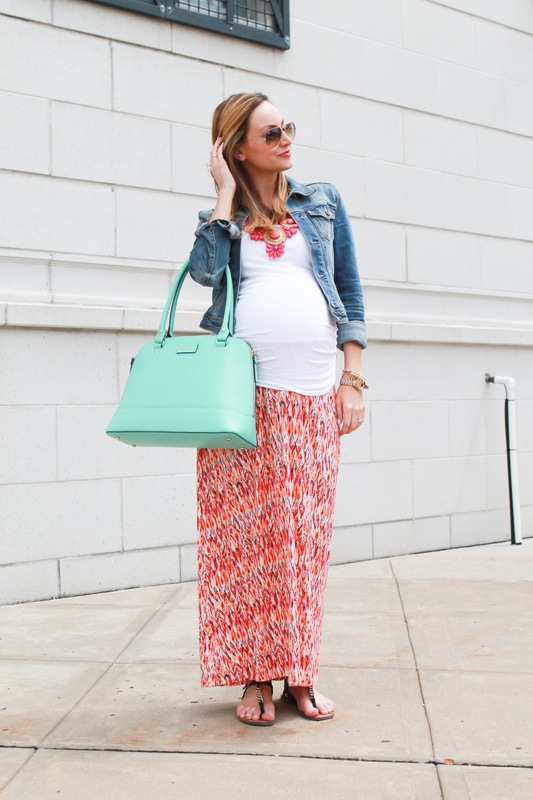 This outfit is the epitome of everything I hate about maternity wear…. and yet, here I am, wearing it! UGH. I just feel like every pregnant woman you ever see has this outfit on: maxi skirt, tank top, denim jacket… like no matter the season, summer, winter, that’s what they’re wearing. And do you know why? Because that’s really all maternity lines will make! I tried to not ever wear an outfit like this in protest, but alas, here I am. Being THAT girl. This skirt is one of the last maternity items I have bought. I made a vow to myself to stop buying maternity clothes at a certain point because I really don’t need any more, ha! I was drawn to the print on the skirt, and even though I tried to stay away from wearing an outfit like this, the skirt sold me. 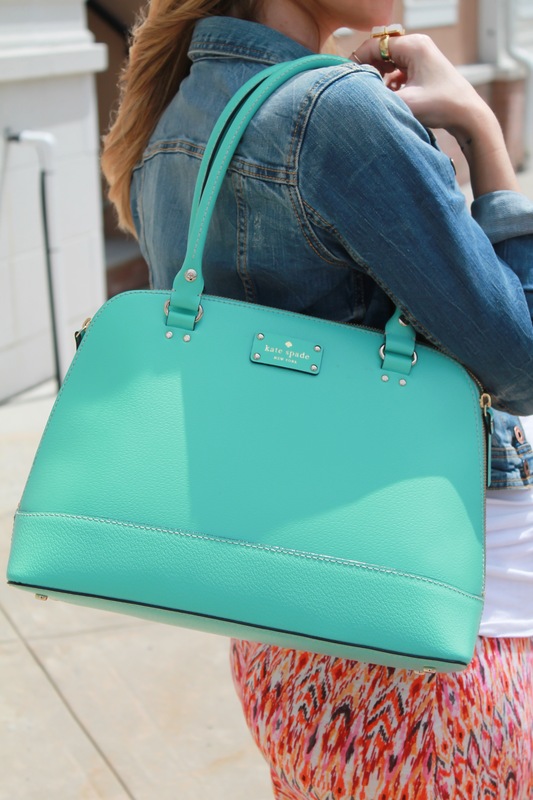 It’s bright and fun and OH MY GOD, so comfortable! It’s not hard to see why all those pregnant women wear outfits like this. A key styling tip if you’re going to take the easy way out & wear THE maternity outfit like I am: statement pieces! To avoid looking like every other pregnant woman, throw on a statement necklace eye catching enough to make people forget the rest of your outfit, haha! A bold lip doesn’t hurt your case either. Ok but in all seriousness, this outfit is so comfortable and being that I’m due in about 2 weeks, I’m really all about the comfort right now, ya dig? hahaha! So funny, I finally pulled out a maxi skirt the other day, although I was trying my best to hold off. LOL I did the same! I went through my entire pregnancy with Char without wearing an outfit like this but I finally gave in too haha they’re too comfortable not to! That. Necklace. Is. So. Fierce. Previous PostPrevious Skater Skirts fo’ sho.